Claudio was born in Salerno on October 24th, 1969 and started his artistic career (when still had his hair) as tourist entertainer, for four years, in several seaside resorts in southern Italy, working with names like Walter Santillo, Paolo Orlando, Giacomo Capuano, Michele Lambiase and Fabio Rufolo. His attention moved toward to cabaret and stand-up comedy, writing and performing satirical monologues about politics and society; he made shows in various night clubs and theatres in Campania and Lazio; he was invited to play his shows in several events of “Festa Nazionale de L’Unità” in Rome between 1997 and 1999 and appearedt in some episodes of TV programme “Seven Show“, during the season presented by Alessandro Greco, in 1998 on Italia 7. He won the “Premio della Critica” (critics’ award) of “Salerno Ride” for the national cabaret contest “Premio Charlot“, in 1994. In 2007 he ranked 3rd for the national cabaret festival “Cabareboli” at Eboli, also winning the “Premio della Critica” (critics’ award) and “Premio Miglior Tempo Scenico Comico” (Best Comic Timing). 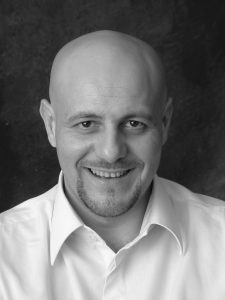 He featured in several series, for RAI and Mediaset, such as: “Un posto al sole“, “Il bello delle donne“, “La Squadra“, “Incantesimo“, “Grandi Domani“. In 2007 he was the main character in “Festival di Sanremo” official commercial. 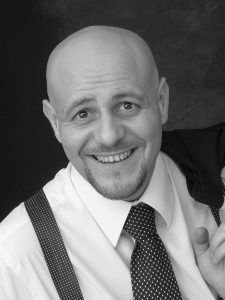 He also worked as comedian in the successful tv shows “Zeresimo Minuto” (by Ivano Montano) and “TNT iTopiNipoTi” (by Ivano Montano e Nello Nigro), playing several comic characters. For ten years he was permanent guest on the radio for the hit show “Ho perso il trend” with and by Ernesto Bassignano and the partecipation of Ezio Luzzi, on Radio RAI Uno, playing several comic characters. He featured several short-movies and full-length films for the cinema, such as: “Ladri di barzellette” by Bruno Colella and Leonardo Giuliano, “La consegna” by Gerry Petrosino and Vincenzo Campitiello, “Guerra” by Antonello Novellino, “Lady Joya” by Fabrizio Guerra. One’s first love is never forgotten: theatre! After paying his dues in amateur and semi-pro acting companies, he worked (and continues to work) in numerous national productions, in both comic and dramatic roles, together with names like: Riccardo Garrone, Edoardo Siravo, Vanessa Gravina, Nathalie Caldonazzo, Eva Grimaldi, Emiliano De Martino, Vito Cesaro, Claudio Boccaccini, Francesca Fava.